It doesn't matter whether you're a Mobile Professional, Laptop Owner, Home/Small Business User, Student, Multimedia Enthusiast, or other type of user. Easy Computer Sync is designed to work for you! Convenient and easy way to synchronize data with your Netbook. The fastest way to transfer data to/from a Netbook. 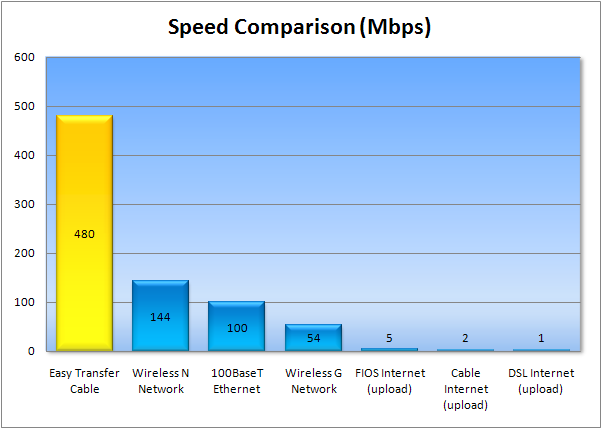 Much faster than Wireless G or 100BaseT Ethernet. Designed for smaller screens on Netbooks. Designed to be used while travelling or at home. Save time and hassle synchronizing your data before a business trip. The fastest transfer speeds available. Why should you wait for a slow network connection? Designed to be used while travelling or at the office. Easily synchronize data with a co-worker or associate while on the road. Easily synchronize data between any two computers at home or at work. Works great when you bring your work computer home, and need to synchronize a folder or two with your home computer. No complicated network settings, firewalls, or passwords to deal with. Just connect the cable and go. Fastest possible transfer speeds. Quickly synchronizes your movies and music with your laptop before travelling. The fastest possible way to transfer multiple gigabytes of data between friends and family. Keep your desktop computer and laptop in sync. You'll never forget that important file again! Easily synchronize data with a fellow student or friend. No complicated network settings to deal with. You'll be impressed how quickly you can transfer large amounts of data (such as movies and music) between computers. Great for pushing large amounts of data onto a multimedia server. Easy to use - no complicated network settings or passwords to deal with. Works well when you need to synchronize movies between your desktop and laptop before travelling. Easy Computer Sync is designed to use the Easy Transfer Cable for transferring data. In most cases, the speed of your hard drives will be the only limiting factor. This means that with Easy Computer Sync and the Easy Transfer Cable you are getting the fastest transfer speeds possible.